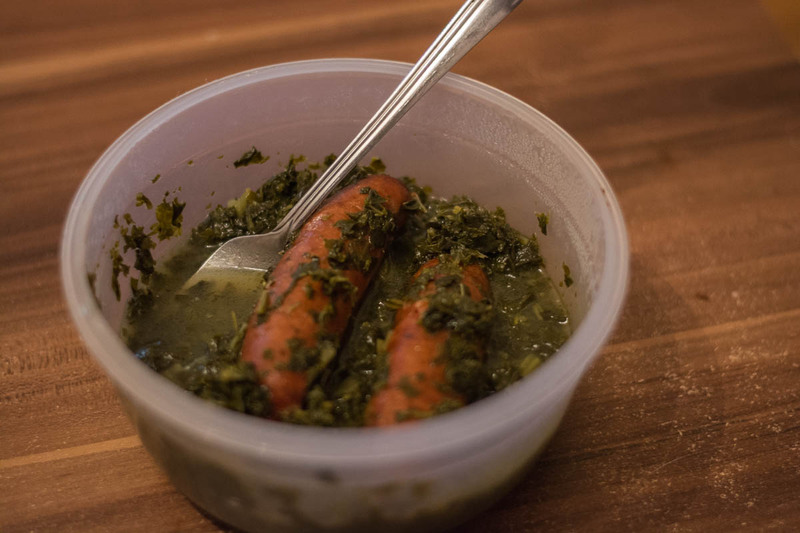 In winter it’s basically a winter custom here in Northern Germany to eat Grünkohl (kale or leaf cabbage). It might have something to do with the fact that kale is harvested after the first autumn frost, which means you get it during the cold seasons on the table. Grandma invited me yesterday because she prepared Grünkohl, Kassler (smoked pork chop) and Kohlwurst (cooked sausage). Together we just call it Grünkohlessen (eating kale). That’s the usual combination and of course you eat it with cooked potatoes or fried potatoes. The good thing is, you can eat it on the second day too (it even tastes better one day later), which is why my grandma prepares enough. That means we ate it today again and since there was still much left, grandma said I could snack it at home in the evening if I like. And of course I liked the idea because Grünkohl is one of the reasons why winter is good too! It’s one of my favorite dishes, and it fits so well to the winter. Popeye the sailor from the cartoons eats spinach and it makes him stronger. I feel the same but after eating Grünkohl. I really feel like I could uproot trees with my bare hands when I eat Grünkohl (laugh). By the way, you only see the kale and cooked sausage in my photo, and as said, there is usually also potatoes and smoked pork chop. But I do also like to eat the kale and the sausage without anything else. That’s what I had in the plastic bowl because that is what was left from our dinner. I feel that way after mashed potatoes, meatloaf and gravy. Very comforted. That’s our “winter comfort” food special.